Registration closes Tues Jan 27. This month begins Manhattan Tarot's new growth into a beautiful light-filled historic space just 100 yards from our usual location. Manhattan Tarot features monthly Ferol Humphrey Tarot Method experiences for everyone, Tarot Rockstar quarterly features with Guest Presenters of unique quality and skill, as well as semi-annual all-day workshops for co-teaching events which deepen your practice. We are considering an annual Manhattan Tarot bash which lasts an entire weekend. Manhattan Tarot has room for you! ​Join us for Vitality, Originality, and Community. in your work life, spiritual life, and personal associations? In this class, we will use each of the suited Nines for judging when we have enough experience for manifestation, and see how the Tree of Knowledge and the Tree of Life work together in the Nines to prepare us for our own unique expression of life. We will talk about how this works for us a Middle Path in life, as well as how the powerful Nines mediate the energies of expansion and contraction which we all encounter daily. Join me! 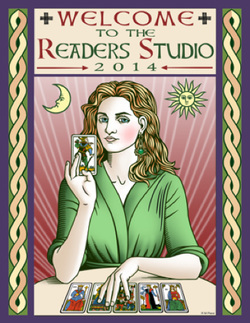 You will also get the best of 20 outstanding Tarot educators, as they share their accumulation of knowledge. This year, Rachel Pollack asked me to conduct her pre-Master Class interview, which introduces her to the attendees of the conference, and in which she announces this year's Master Class topic. Rachel and I have known each other for about 11 years, meeting at the Wisconsin Area Tri-State Tarot Symposium, 2007. I subsequently produced an event for her in the American South, and we have continued correspondence. She is an amazing woman and a prodigious creator, writing for DC Comix' legendary Doom Patrol in 1995, where her character Coagula, Kate Godwin, worked around the Justice League as a transfemale lesbian superhero. Rachel has also won the prestigious Arthur C. Clarke Award and the World Fantasy Award for her work in science fiction. In Tarot she is best known for the perennially-selling Seventy Eight Degrees of Wisdom, and her Shining Tribe Tarot, but has written over 30 Tarot books and worked with Herman Haindl on the companion book to the Haindl Tarot. Rachel is a well-known maker of gemstone jewelry. She practices her writing and manages her international teaching schedule from Tarot on the Hudson, Rhinebeck, NY. ​"Context, Scale, and the 3rd Point of Emergence"
drawn from the best Tarot educators the world has to offer. This year I facilitated the Foundation Reading at the beginning and end of the convention, and was one of the Master Class Interviewers, for presenter Barbara Moore. I also had a really good time as MC for the Saturday night banquet, introducing Tarot Live! with Marcy Currier, and in general harrying the audience with my particular brand of interaction~ designed to involve everyone. It was great fun. "Join our international event as hundreds of tarot readers, teachers, authors and artists gather for three extraordinary days of tarot study and play." This year we had a huge group from China, and old friends from Iceland and Canada, as well as England's beloved Kim Arnold, and author Liz Dean. It was fabulous! We also had an astonishing surprise drop-in visit by Stuart Kaplan, the founder of U.S Games Systems, Inc., who is basically responsible for handing us the modern Tarot world through his publication in the early 1970's of the Rider Waite deck, and its subsequent travel all over the world, to become the best-known and best-loved Tarot deck of all time. What an amazing thing to see Stuart Kaplan at the convention! We were all deeply appreciative and let him know it. I have attended this event every single year since my first experience in 2007, and personally encouraged about 50 people who did strike out for adventure, and really loved it. This will be my 10th straight year, because only at Readers Studio can I expect to meet people from all over the world, in such numbers~ up to about 220 maximum. In 2015 we had almost 60 First-Timers, among them maybe 12 from Canada alone! We also met 4 from China, and each year brings people from further away~ South Africa, Iceland, England, Australia. My talk with Kim this time will be our 3rd great show together. Kim's Telesummits are very popular, as they offer a very fine free level of participation, along with several buy-ins which provide many gifts offered by the various presenters, so those with the budget may clean up on truly outstanding learning materials in this fast-growing esoteric growth art. As usual, my talk is centered on real change in the moment! <<<< Click the image at left for more info. for a gathering of the brilliant and amazing> you folks! pull a card or two, meet some of the wonderful people we know! We had pots of tea and snacks to share. smoothies, and fresh juices that the Jivamuktea Cafehas for sale. but people came when they liked and stayed however long they wanted. or Ferol using Contact Form above. Angelo and I get back together to further explore our work in Tarot. This time Angelo opens up the discussion to include philosophy and world view~ including animism. We discuss feminism, gender equality, and my history as a human being rather than a feminist, in dealing with gender in the Court cards. See what you think. ​Upper left shot is a photo, Lower left is the video. Angelo is the bombe, and I am very supportive of his work in global Tarot. He has a great blog and a very active YouTube channel full of educational information for those interested in modern use of Tarot. You should check out his book, Tarot: Unlocking the Arcana, Schiffer Books, 2016. I explain the layout I use most frequently. If you click anywhere on the video screen, the image will open up and you will have better visuals for all of the five cards. Enjoy! This is an edit by Tarot historian Giordano Berti of Italy, of portions of a longer interview by George Steptoe of NYC Lens. Giordano has pulled together the best parts of the full interview, focusing on his publication, The Vergnano Tarot, 1865, which I use in the interview. I own the deck, and consider it one of the 5 finest decks in my very large collection. George filmed and asked questions while I discussed the nature and uses of modern Tarot with a few of my friends from NYC who gathered to meet with him. Everyone had a great deal of fun, on all kinds of Tarot-related topics~ feminism, ancient and modern uses. The full interview was lost when the NYC Lens deleted its 2015 video archive, alas. But due to Giordano's efforts, we have this bit about his Vergnano! George Steptoe reported from Brooklyn for NY City Lens before heading back to UK for more cultural and political reporting. George’s previous work has been published in Vice, The Daily Telegraph, The Diplomat, Southeast Asia Globe, Prospect Magazine, East End Review and others. George was formerly a freelance reporter for a local paper in Northeast London before decamping to correspond from Cambodia. We begin life seeing and hearing the world, feeling our bodies, talking spontaneously. Before cultural concepts, family agreements, or self-mastery, we experience it all, wondering “What has this to do with ME?” As children our character forms first by experience, then by training. That is the key to real development: Experience Now, Analyze Later! In this Study Group, we peek into the process of a very successful learning system. Taking us into the experimental unknown, deliberately alternating feeling, thought, and voice, Ferol Humphrey Method makes us smarter, more confident, and more loving adults. FEROL HUMPHREY is a well-known writer, educator, and motivator. She challenges and delights audiences in conferences and group learning events around the world, with her key to personal growth — Immediate Adventurous Experience! Ferol's methods are radical, precise, often hilarious, and highly effective. You spend your old ideas, and keep the change. This year at the start of the program, I introduced attendees to the Foundation Reading, the cornerstone of the Readers Studio experience. A little later on, I introduced The Curious Order of Arcana Arts, a very unusual theatre troupe, at the Saturday Banquet. At the close of the event, I then facilitated our revisitation of the Foundation Reading, where after a full weekend of learning new skills, we apply them to the same questions and the same cards and layouts we used at the beginning of the event, so that we can see in a really practical way, what we have gained. I was also available as one the featured Celebrity Readers in the evening portion of the program, Friday and Saturday nights. This stretch of 30-60minute evening appointments are for all~ for those who visit the hotel, attendees, luminaries, and presenters. I enjoy working with the self-starters who book these consultations. Even leaders occasionally clog down and get dispirited. Let's pick those spirits up and get back into the game! If you cannot get with me during my official appointments, we can probably find a quiet place at some other point, so approach me and ask. I am willing to be very declarative, but am not primarily a divinitory reader. I work in a much bigger macro, the context of who you are, what you need and are trying to accomplish. Readings with me help you recognize yourself, act on what motivates you, and move forward with more self-understanding and grace. Click photo at left for info and registration. I will be presenting a workshop called Light & Shadow in Daily Life, using my crowd-pleasing depth process, Ferol Humphrey Method. I am really looking forward to this little gem of a conference, in the cold, cold North in the dead of winter. When we get together, all kinds of hot stuff gets a-happenin'! Warm up with us! Some of my very favorite people in world Tarot will be there, including Melani Weber, Nancy Antenucci, Barbara Moore, Michael Foster, Lisa Novak, Jeannette Roth of Tarot Garden, and more. The producers of the event plan to keep the conference small, so that great community intimacy develops and more is possible. FINDING YOUR FORTUNE IN THE FIVES, with Ferol Humphrey, Oct 17, 1pm PDT. Click photo above for information and free enrollment. We had a truly incredible, stellar, ALL-STAR cast of dedicated and responsible presenters. My colleagues in this summit were multiply-published, honored convention and symposia presenters~ at the top in their field, many of whom travel the world regularly to teach this material. We focused on the 4 Suits, the 16 Court Cards, and the Ace-Ten. I asked especially for The Fives~ from my perspective, the Fives in Tarot are where the action is, where things tend to change dramatically, as they are in the middle between the early building process and concluding energies. Speaking at this Telesummit was great fun! I really enjoyed sharing the special magic of The Fives. 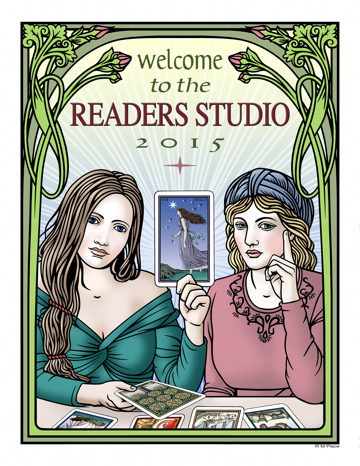 THE READERS STUDIO~ Produced by The Tarot School~ SOLD OUT! Click photo at left to visit the website. Celebrity Psychic Fair~ Personal Tarot Consultations. 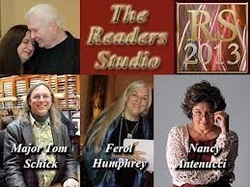 Each year The Readers Studio makes available some of the best known readers in the world. I offered 30 and 60 minute sessions between 9-11pm both Friday and Saturday nights, to sophisticated, mature people from around the world. 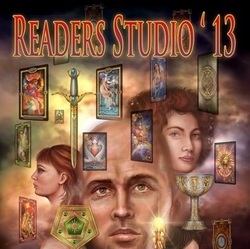 Ruth Ann and Wald Amberstone have been producing the biggest Tarot convention in the world since 2003. I attended for the first time in 2007 and have not missed a year since. Why? Because it is the single most transformative community experience of my life. Every year, I look forward to seeing and laughing with my associates, colleagues, and friends in the international Tarot world. We have breakfast, lunch, and dinner, ride elevators up and down laughing and becoming friends. We show each other rare and out of print art works, learn new techniques together, and share old ones. Most importantly, we welcome the newcomers~ newcomers to the astounding scholastic and esoteric world of Tarot~ in its vivid fascinating cross-cultural history over 600 years. In terms of personal experience, gathering with those of like mind for growth and cathexis is a major opportunity. I look forward this year to seeing scholar Yoav Ben-Dov of Tel Aviv, artist and historian Robert M. Place, the irreplaceable Rachel Pollack, Tarot magnima Mary K. Greer, Paul Nagy of Tarot Hermeneutics, and many, many more wonderful people. Check the presenter and instructor roster, as it is quite impressive, and we haven't even talked about the attendees! Readers Studio attendees are wonderful adventurers, from our newcomers to our luminaries. If you can follow a Tarot reading without a book, you can do it. Come with me next year for the time of your life! ​This official crossing of the disciplines is building in power each year. Gestalt Therapy and the Tarot, Victor Daniels, PhD and Kooch Daniels, M.A. I participated as an attendee. Special Bonus: Art Rosengarten, PhD was in attendance. I was in in New York for a brief visit with friends and colleagues during the second weekend of January 2014, and had the great fun of sharing a teaching experience with the Amberstones, Founders of The Tarot School. The Tarot Salon is held in Forest Hills weekly, and is a power-packed esoteric and practical experience for those lucky enough to attend. Make your own luck! Click the image at left to visit the Tarot Salon page on The Tarot School website. This was a great interview on the meaning of the Death card. We discussed the historical and constantly changing approaches to the most famous Tarot image of all time, Death. 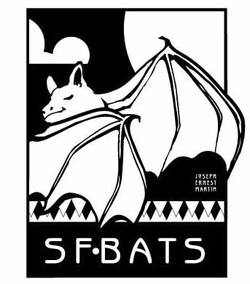 In 2008, I attended the San Francisco Bay Area Tarot Symposium, SFBATS. I made a special point to see Holly Voley's talk on the Death card, across 600+ years of playing card history. It was rather a game-changer for me, as it pointed me from personal use of the cards to card imagery as a focused window on social and cultural evolution expressed through art, often commissioned by some of the wealthiest and most influential political families in society across the world. Click the photo at left to visit the SFBATS website and Speaker List. There is nothing like a BATS! Now in their 22nd year, the San Francisco Bay Area Tarot Symposium is the longest-running continuously produced Tarot convention in the world. Produced by Thalassa, a force of nature in the Tarot world, this is a wonderful multi-track concentration of some of the smartest and most accomplished people in the international Tarot world. Up-and-comers and established Greats meet with dedicated long-timers and excited novices at this wonderful, warm community educational experience. Vendors galore, endless opportunity. Socializing and networking not to be missed! Ferol taught Living Tarot Method Intuitive Development. Living Tarot Method is designed to light up your whole brain, connect your thinking to your heart, and your feelings to your speech, like nothing you have ever experienced before. See and feel yourself in a truly fresh and possibly shockingly new way. It is so much fun! And behind the fun, there is an incredibly intelligent process helping you to evolve, right in the moment. Students, instructors, new readers and professionals~ all find the remarkable techniques of Ferol's Living Tarot Method energizing, surprising, and highly productive. You'll see, if you contact her yourself! Click photo at left to visit The Readers Studio website. 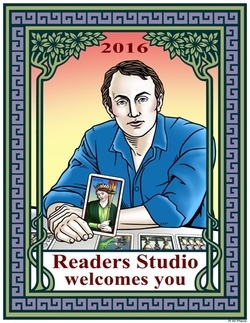 Many lively, dedicated, and enthusiastic scholars, students, artists, and publishers joined me at the international Tarot convention, The Readers Studio 2013, where I gave the room a direct experience of Ferol Humphrey Intuitigve Tarot Method. Ferol's talk has been described as "brilliantly engaging", "perfection on many levels". Predictably, as it is designed to do, Ferol's Method shook up everyone in the conference, revealing the best they had inside themselves. Ferol has attended this annual educational, networking, socializing, and publishing event every year since 2007. Friends come together from Europe, the US, Africa, Iceland, Australia, New Zealand, China, India, everywhere~ for the extremely satisfying experience of being with others who share their interest in the ancient art of Tarot. 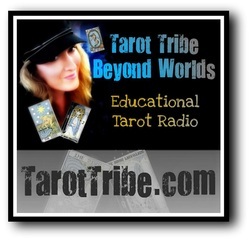 BEYOND WORLDS - YOUR TAROT TRIBE, Sunday March 10, 2013, 7pm EST. Beyond Worlds - Your Tarot Tribe is peeking out of its sabbatical to have a little winter warm-up! Sunday, 3/10/13, Wald & Ruth Ann Amberstone will be joining us to interview the 3 excellent Instructors who will be our key presenters at RS13: Nancy Antenucci, Ferol Humphrey, and Major Tom Schick. If you can't catch us live, we promise to keep the archives cozy & warm for you. Let's talk about tarot! Click the photo at left to go directly to the website. 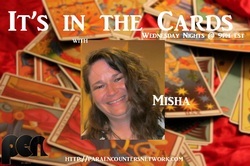 IT'S IN THE CARDS, WITH MISHA~ Wednesday, Jan 2, 2013, 9pm EST. MEET FEROL HUMPHREY, Archangel Channel, Healer, Medium. 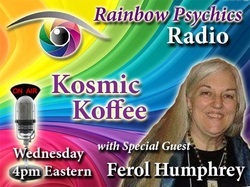 *** In this show, Ferol begins to really share publicly about her experiences in 20 years of channeling the Archangels. This is unusual material which she has not shared before on the air. Learn about healing, mediumship, and the various ways one may think reasonably about such radical activities. Learn wondrous things, including Living Tarot Method, Ferol's unique personal change process, and Blue Lotus Heart Chi Gong, for managing your personal energy and daily emotional world. This stuff really works! "Ferol returns to It's in the Cards for a full hour of interesting chat, new information about the art of Tarot, and a little bit of laughter about life in the wild outback of East Texas, where Tarot is alive and kicking up a storm. Ferol will discuss The Readers Studio international conference, and tell you why she is so passionate about it." Click the photo at left to visit the YouTube archive of the show. This was a really good show, and we got a lot of info and fun packed into our time slot. Check it! Click the photo at left to visit the show archive. Misha interviews The Tarot School's Ruth Ann & Wald Amberstone, plus 2013 Readers Studio presenters Ferol Humphrey, Nancy Antenucci, and Major Tom Schick, on It's in the Cards, 9pm EST. Enjoy some great fun and get a taste of our major groove thing of 2013. This was a lot of fun, and very informative visit with people we usually do not get to talk to! It has never been easier to enjoy the show. Just click the link below, and the show will stream from the home page. No login, no tech messing, just awesome good fun. See you soon, my friends! Click the photo at left to visit the YouTube archive of the show.